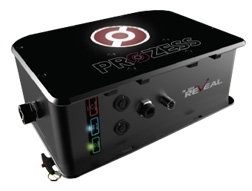 The Reveal™ optical spectroscopy-based measurement system will help customers increase quality, yield, and productivity while reducing both risk and downtime in the manufacturing environment. Its measurement capabilities are unmatched by legacy techniques. Better, faster, and the key piece in providing continuous process, closed-loop control make it ultimately much less expensive than other approaches. In the past, this technology, due to its price and complexity, was reserved for only the toughest and most complex applications. Now, it is available to many manufacturers in a variety of industries. The use of light as an analytical tool affords a number of distinct advantages over alternate methods like off-line laboratory sampling or traditional chromatographic analyzers. Because light is non-intrusive to the process, it can be installed in-line without touching or influencing the process stream. The measurements can also be performed incredibly fast, typically in millisecond time scales, to allow real-time characterization of quickly changing sample streams. Furthermore, light-based systems are inherently more robust and accurate than conventional methods, as the measurements can be made directly on the sample, without variable sample processing or needing human intervention. Light allows measurements that are direct, fast, accurate, and automated—all hallmark needs for process measurement technologies. Contact us today to learn more, or call (855) 737-4714 for immediate assistance.